See what’s possible, when nothing gets in the way. The powerful new Galaxy S8 has a stunning Infinity Display that’s all screen from edge to edge. It has our best cameras ever and is sealed from the inside for true water resistance. We’ve never made anything quite like it. 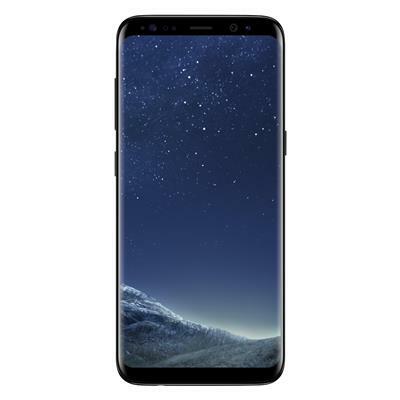 Samsung Galaxy S8 provides ingress protection (IP68) against dust and water to a maximum of 1.5 metres for up to 30 minutes. See http://www.samsung.com/au/pdf/IP68.pdf1 for details regarding proper care/use of device. All screen from edge to edge, our stunning new Super AMOLED Infinity Display lets nothing get in the way. The 5.8-inch display on the Galaxy S8 and 6.2-inch on the Galaxy S8+ are not just big, they’re also our highest resolution smartphone screens yet*. So now you can see more, do more, and experience more, in a whole new way. Screen measured diagonally as a full rectangle without accounting for rounded corners. With advanced cameras front and back, your life has never looked so good. The all-new, 8MP front-facing camera has smart auto-focus so selfies look sharp and absolutely stunning. On the rear camera, Dual Pixel technology can cut auto-focus time to as little as 0.2 seconds to catch quick movements. And the F1.7 lens and large 1.4μm pixels help give you crisp, clear shots, even in low light. Beautiful, time after time. Time may vary due to conditions. Sealed from the inside, the Galaxy S8 can handle real dunks, not just spills and splashes*. The IP68 rating tells the full story. It’s water-resistant to 1.5 metres for up to 30 minutes. And it’s dust-resistant too – without the need for any extra cases or covers. Finally, something precious that you don’t have to be precious about. *Samsung Galaxy S8 provides ingress protection (IP68) against dust and water to a maximum of 1.5 metres for up to 30 minutes. See http://www.samsung.com/au/pdf/IP68.pdf2 for details regarding proper care/use of device. Max of 1.5m/up to 30 mins. The Galaxy S8 is our first phone that’s capable of downloading at speeds of up to 1Gpbs*. That means it’s capable of quick downloads, less buffering and fewer interruptions. It also features a revolutionary 10nm chipset – helping to give you more power while using less battery. Now you can do more, for longer. Samsung Galaxy S8 is a Cat.16 device capable of downloading up to 1050mbps. Iris authentication may not function in certain circumstances. See samsung.com/au/iris for details. Facial recognition may not function in certain circumstances. The Galaxy S8 already comes with 64GB of built-in storage, and adding even more is simple. Just place a microSD card in the slot for up to 256GB of extra space. You also get unlimited online storage for all your photos and videos with the Google Photos app, so you can keep a lifetime of memories. Up to 52GB user accessible, depending on installed software and firmware. Up to 16mp per image and 1080p video resolution. Subject to Google Photos third party terms and conditions. With fast-charge technology, the Galaxy S8 powers up in no time. Both wired and wireless charging are incredibly fast. Using the fast wireless charging pad it’s also exceptionally easy. Simply place your phone on the charging pad, and that’s it. The Galaxy S8 gives you the power to explore new worlds in new ways. You can pair it with the Gear VR and dive into virtual reality for incredible adventures. Connect it to the Gear 360 to live stream your own amazing moments in 360 degrees. Gear VR and Gear 360 sold separately. Internet connection required for live streaming and content download.